This year marks the 10th anniversary of this food-focused event and to celebrate, the Arizona Restaurant Association is giving diners a chance to win big during Fall ARW with an exciting online contest. 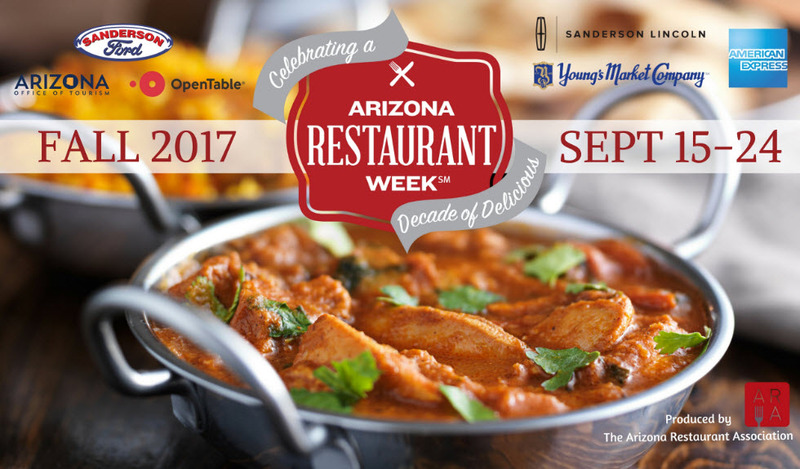 Event updates along with a list of participating restaurants and their ARW menus can be found at www.ArizonaRestaurantWeek.com. WHAT IS ARIZONA RESTAURANT WEEK? Arizona Restaurant Week is the most edible time of the year, giving local, regional and national food lovers the opportunity to enjoy a prix-fixe dinner for $33 or $44 per person (unless noted: excluding beverages, tax, and gratuity) at a number of participating Valley restaurants. Arizona Restaurant Week’s goal is to position Arizona as one of the top culinary destinations in the nation by increasing awareness of the many dining opportunities available in the state, as well as stimulating business and revenue for restaurants throughout Arizona. WHO PARTICIPATES IN ARIZONA RESTAURANT WEEK? Many of the finest, most renowned chefs in Arizona will showcase their culinary styles for diners. The event will feature an array of well-known restaurants that will provide unbeatable prices offered during this week only!